The wise never marry. When they do, they become otherwise. Your future depends on your dreams. So, go to sleep. Children in backseats cause accidents, accidents in backseats cause children. Save water. Shower with a partner. Today ends the National Movement for Young Legislators (NMYL)- Bohol 1st General Assembly for new set of officers headed by its president Provincial Board Member Ae Damalerio. SK municipal presidents headed by Jane Censoria Cajes, vice mayors and councilors, attend the said assembly. DILG Provincial head Dame Rustica Mascari�as, Rep. Edgar Chatto, NYC Commissioner Benjie Oliva have shared their inspirational messages. The SK federated members will continue their 1st Strategic Planning. My congratulations to William and Sheena Marie (nee Cubillo) Galon who were united in marriage last January 20 in Calape. William is my �igso,� the godchild of my Papa Dodong. The lovebirds met in one of the parties they�d attended and William was instantly smitten when he saw Sheena. I think, the whole barangay of Booy (I mean William�s friends and cousins) went to Calape to give support to the newlyweds. The wedding was held at San Antonio de Padua Chapel where it housed the miraculous image of St. Antonio de Tinibgan in barangay Tinibgan. The principal sponsors were Kag. Rogelio Buladaco, Capt. Adolfo Utar, Mr. Jojo Asoy, Capt. Eutorgio Telmo Jr., Arino Udtohan, Prudencio Arabejo Jr, Adela Buladaco, Pilar Estafa, Joy Asoy, Narcisa Gomez, Paulina Udtohan and Panfila Calamba. William is connected at the Grace Christian Military School. True�s blind item last week about an SP lawmaker who�s into Freudian slip drew reactions and additional tidbits from readers. According to True unimpeachable Very Reliable Source (VRS), the wife of �The Gardener� would sue her philandering husband yet she changed her mind after some thoughts. The husband is seen not being affected of the issue. �In fact, there was a confirmed report that this husband had sired two women simultaneously, hanep! In our double standard society, it is a symbol of machismo,� VRS added. On the other hand, �Flower� is convincing her sisters and friends that she has not doing �it.� Her siblings have been calling her husband that the issue is not true. VRS added that the husband has to believe yet. The song, Hiram (popularized by singer Zsa Zsa Padilla) is �Flower�s� favorite song. The husband is outside Bohol working for �Flower� and their child since December. According to VRS, �Flower�s� husband is still confused and wished to come to Bohol to iron things out. �Even the child is no excuse of the tsismis. During the baptismal, �The Gardener� was invited as the child�s ninong and gave a crib as present,� VRS shared. Betrayal is a sick suffering and this keeps haunting on �Flower�s� husband. Kawawang nilalang! As expected this time of the year, Bohol was once again united--nay, groaning!--not only with ubi farmers and growers, and also with LGUs to promote their ubi products. Though the drumbeat of the Ubi fest was not like the previous celebrations (with Zen Darunday as the keynote organizer with the help of Rene Sumodobilla and Tagbilaranon Asociation of Northen California, where are they now? 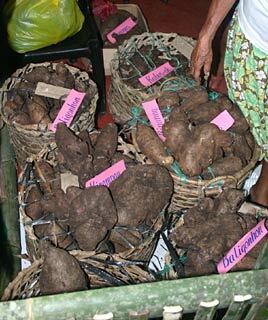 ), there were still display booths of ubi varities like aromatic kinampay, kabus-ok, iniling, tam-isan, baligonhon, binanag, binugas/gimnay, binato and my favorite, apale. It was Ubi festival once again. There were ubi products for sale (though a little bit expensive, an ubi farmer told me that the raw product is expensive since growing ubi needs time and patience) like polvoron, cake, chips, halaya, jam, candies and sweets. There was absence of ubi beauties too. I missed the beautiful girls. On Wednesday, Jan. 23, the sun mercifully came out after breakfast time, this time for the parade of participating towns. After our hearty dinner at Cora Arasan�s residence in Dauis (wherever the fiesta, True is always there), Emerson and I (together with high school classmate Jan Mejkal Manalo), we went to the Bohol Cultural Center to witness the cultural contests for the Ubi Festival. The night turned out to be for talented Boholanos. I have my heart for cultural presentations and I don�t want to miss a moment without witnessing it. In this 3G, it�s rare to see people whose passions are into balak, balitaw and kuradang. And time will come that these cultural assets would no longer be available to the young generations. Where else you can find ubi (ube in Tagalog, yam in English) venerated but only in Bohol. 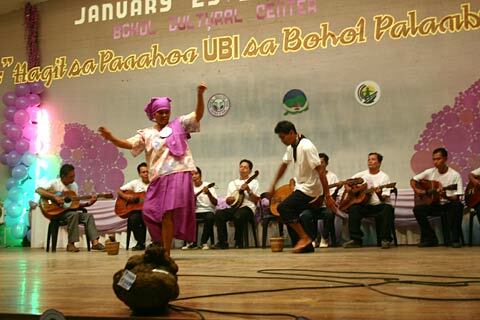 Yes, ubi is sacred to Bohol . There is a unique tradition in Bohol that people kiss the ubi every time it falls to the ground as a sign of reverence (Historian Marianito Jose Luspo, Provincial Agriculturist Liza Quirog and my parents confirmed this tradition). And when you speak of ubi to Boholano, there is always a story to tell and it is the only staple food included in the Bohol hymn. 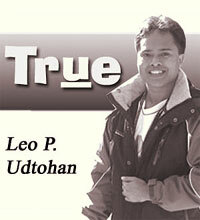 (I wrote this for Inquirer Global Nation sometime in 2005). According to a legend, there was a famine in Bohol. In a constant search for a food, someone accidentally struck a fleshy tuber in the ground, some colored white and some with purple color. The famished settlers cooked it and found the tuber to be very delicious and highly nutritious. The unknown tuber saved people from family. Thereupon, the newly discovered tuber was instantly venerated as a savior crop. Even 1999 Miss Universe 1st RU Miriam Quiambao (an ubi beauty queen to us) loves our ubing kinampay. She had the chance to cook ubi products during her visit here in Bohol. Many people from other parts of the world continue to order ubi products because our ubi is different from the rest. We love our ubi. Hail to our ubi. I hope for a fruitful and fanfare celebration next year. The lack of skilled Medical Transcriptionists (MTs) in the Philippines prompted a group of Boholano entrepreneurs to establish a training school for MTs with program fees that fit the budget of the mainstream market. Bohol Powerhouse Scholastics, Inc. (BPSI) , located at Ramvil Building in Tagbilaran City , officially launched the Medical Transcription Course yesterday, Jan. 26. A Medical Transcription is an allied health profession encompassing the process of converting voice-recorded reports as dictated of physicians and other health professionals into text format. MTs are employed in hospitals, physician�s offices, transcription service offices, clinics, laboratories, medical libraries, government medical facilities or in their own homes earning dollars as one of the most highly in demand technical health courses in the world. The course runs from three to eight months. BPSI is the first and only training institution in Bohol to offer Medical-technical and Vocational courses. It offers both weekday and weekend classes, with fully air-conditioned classrooms and state of the art facilities plus seasoned trainers and Tesda trained instructors. The BPSI administrative staff is composed of Jovito Danilo Nazareno, director; Arlene Palgan, academic administrator; Glenn Navarro, administrative officer/SAO; Elsa Myra Balistoy, finance officer; Perla Geminiano, guidance/registrar; Grace Pancho, health officer; Guidmar Magdadaro, LPN coordinator; Ma. Eva Eleanor recio, MT coordinator; Luz Villanil, MT staff ad Luzviminda Pastrano, secretary. For more information, you can visit BPSI at Ramvil Building, Tagbilaran City or you may call 501-0398. Bohol Powerhouse Scholastics, Inc. (BPSI) family during the launch of the Medical Transcription Course. your comments on "True: Ubi festival and other items "